I poured this after a dry day at work and coming home to learn that I had screwed up in setting the timer I had connected to the Crock-Pot, so it never turned on and the chunk of well-marinated pork I had been looking forward to shredding when I got home had been sitting at room temperature in the Crock-Pot all day. Since the day was cloudy and never got above 60 degrees, I turned the sucker on high and we’ll see if I live or die after eating the finished product. 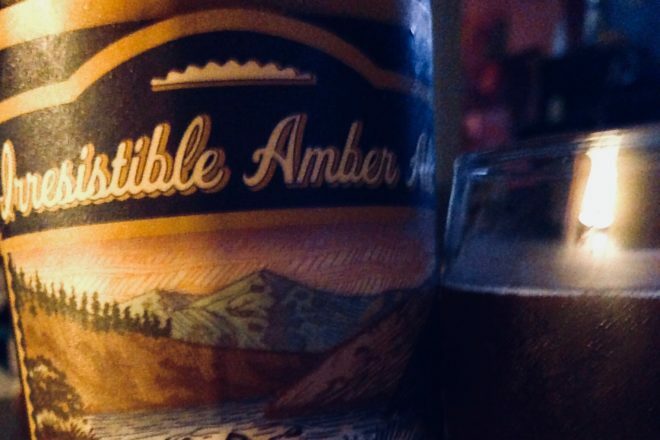 I think I might have mentioned before that there was a time I would go a great distance for an amber ale, but back then you had to go great distances for any beer outside the normal American macrolager. I’m talking about the years before the craft beer evolution/revolution hit the Midwest. It might sound like desperate times compared to today, but it was always a blast to go on a road trip with pals to some distant place either rumored or known to have exotic beer. Or to just stumble on such a place in the middle of nowhere all by your lonesome while going to buy a typewriter in the middle of nowhere on a May afternoon. Irresistible Amber Ale lives up to its name. With the beautiful amber color and sweet, biscuity flavor, I’m going to have to get over to the Bozeman area sometime to see how this stuff tastes fresh from a tap. Really great, I’m betting. So the Crock-Pot pork loin is destined for the trash, and the roasting cauliflower is beginning to smell delicious. I tossed the florets in olive oil, nutritional yeast, lemon juice, thyme leaves, onion and garlic powder, hickory smoked salt, paprika and tumeric.